Early research showed that stelae A and C at Quiriguá are twins; this is quite clear, as they are virtually identical (see figures W0968T and W0960T). However, when Mayan glyphic writing started to be deciphered, it became evident that they were central to a Maya creation myth. The lengthy text on the side of Stela C describes that time began with the “planting” of three stones. On the other side, it gives the date of this event as 13.0.0.0.0, which equates to 3114BC. 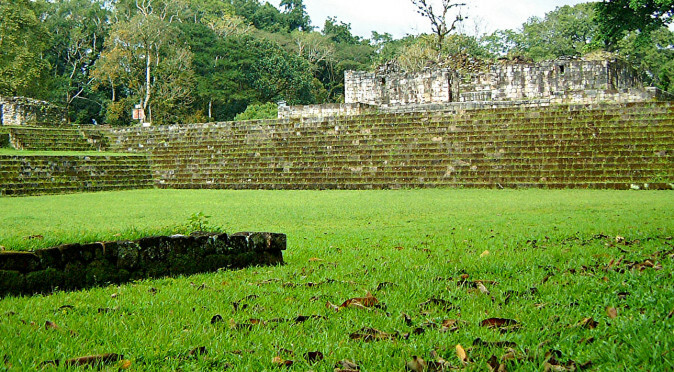 From modern Maya tradition, it is known that the first step to building a home is a ritual known as “planting the stones”. This term which relates to the building of a hearth at the heart of the home using three large stones. Therefore, the planting of the three stones described in the myth can be likened to the building of a new home for humankind. The text begins by describing how the first stone was planted by Jaguar Paddler and his brother, Stingray Spine Paddler. They are known to be responsible for paddling the canoe which carries the dead across the rivers of the underworld. They planted a stone called the Jaguar Throne in the House of Five Sky. Stela C then describes the second stone, named the Snake Throne, as being planted in the Earth Place1 or the Place of Flags2. This stone was planted by an unknown God, described as Black House Great (or Red) followed by an unknown symbol. The third stone is called the Water Throne and is described as being set in the Lying-Down Sky1 or possibly the Edge of the Sky2. 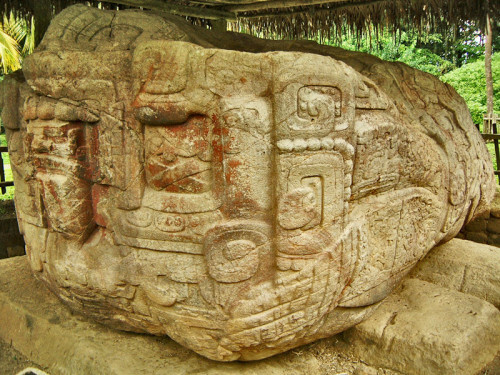 This stone was planted by a deity known as Itzamna, one of the main deities of the Maya and the one responsible for learning and books – he is also known as the “water-sorcerer”. Itzamna is described as tying the stones and the script closes off by saying: “and so it was that Itzamna tied the stones at the edge of the sky, and this became the new place of the three stones”. This last passage suggests that Itzamna gathered all three stones and bound them together in this last place. Stela C completes the story by telling us that the whole episode was overseen by Six Sky Lord. 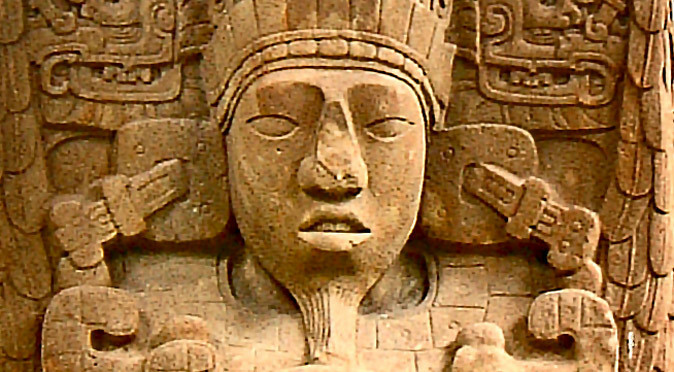 Featured on the front of Stelae A and C is Quiriguá’s mighty ruler, Cauac Sky (see fig. W0968T & W0960T). 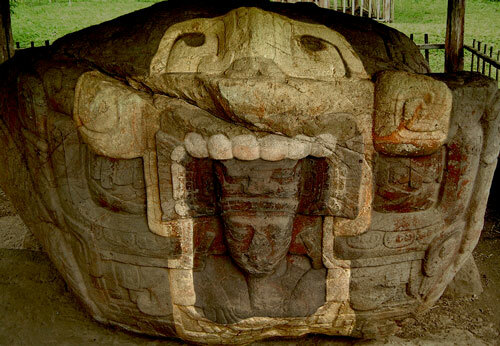 On Stela C he holds a bar across his chest which is terminated at either end with a jaguar’s head with energy flowing from the mouth like a looping tongue (highlighted in fig. W0968J). 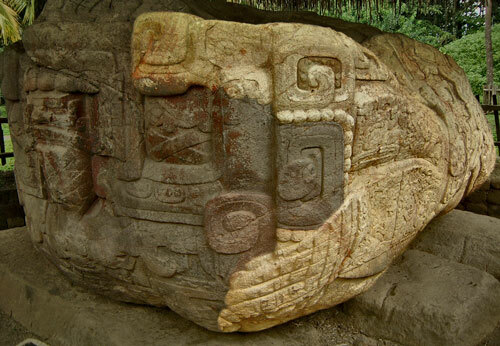 Stela C has a similar bar, which is terminated with a pair of gruesome serpent heads (highlighted in W0960S). The snakes are harder to spot because of their grotesque form; their jaws hang wide open, with curling fangs and forked tongues hanging down. 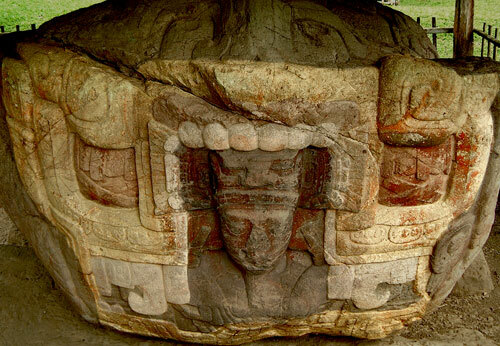 These bars tell us that the stelae represent the Jaguar Throne and the Snake Throne. Curiously, there is not a third stela to complete the trinity. However, the nearby Zoomorph B does seem to complete the story. 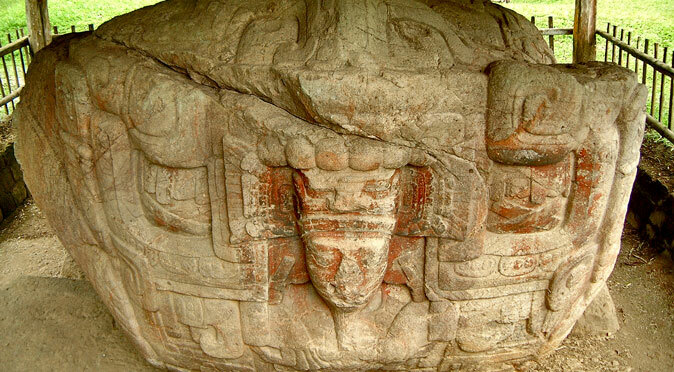 Like stelae A & C, Zoomorph B also features the face of Cauac Sky – only this time his head appears to emerge like a from an enormous turtle shell, which is symbolic of the Creation of the First Father, who was born through the shell of a turtle. A closer inspection reveals a row of teeth above his head, which demonstrates he is emerging from a monstrous mouth (see fig. W0998). Unlike Stela A & C, which are dedicated to recounting the story, Zoomorph B is a thought to be a replica of the third stone. It does look like a large hearthstone as well as an amphibious monster, so it doubly fits the description of the third stone. The glyph that names this monstrous character is badly eroded, but it does start to name Itzamna, which further ties this unusual looking stone to the creation myth text on Stela C.
However, an even closer inspection suggests the single stone of Zoomorph B may represent all three stones. 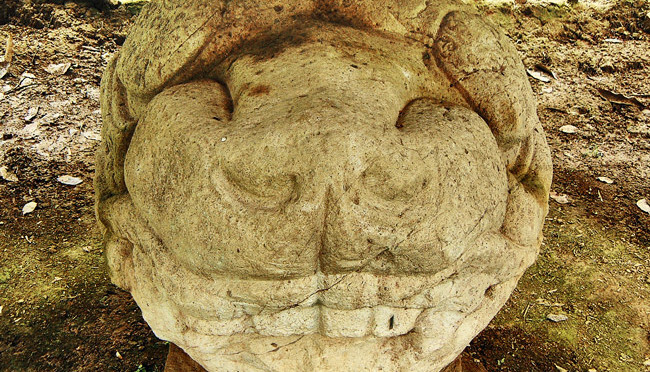 From the front, you can see that above the teeth are a pair of eyes; combine that with two spiral ears either side of the muzzle (just above and either-side of the teeth) and you have what appears to be the jaguar from the bar on Stela C (this is highlighted below, in fig. W0998J). Looking again, the large square shapes either side of the gaping mouth could also be eyes, and the spiral ears of the Jaguar could be the snarling eyebrows of a viscous serpent, identical to the one depicted on the snake bar of Stela A (fig. W0960S). The mouth is then semi-profiled and wide open, with fangs curling from the corner of the mouth, which is below the eye (highlighted in fig. W0998S). From the side things look much different, with another set of teeth curling in a C shape, partly hidden by a large amphibious paw with long reptilian fingers. The eye above the upper row of teeth and the long nose are easy to spot, which combined with the plump elongated body creates the clear image of a crocodile (highlighted in fig. W099C). Whilst the three stones planted are thought to be symbolic of the preparation of the world for a new human existence, the tying of the stones by Itzamna is thought to represent the creation of a throne for the ruler of the new world. 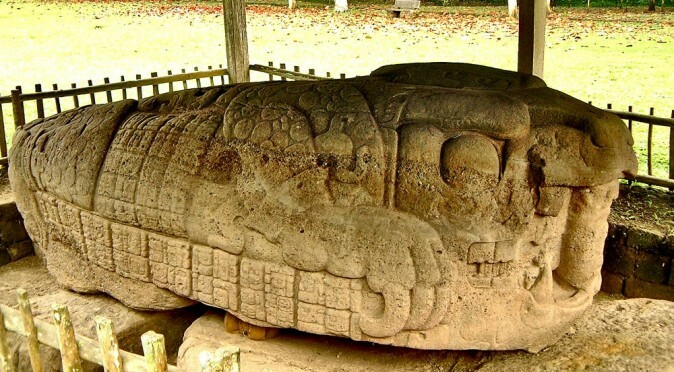 Zoomorph B could therefore be considered to be the three stones tied together, and rather than symbolising the third stone, it is the divine Throne of Creation – and the purpose of these three stones at Quirigua is to tell us that Cauac Sky owns this almighty throne. Fig OR10 – OrionThe Creation Myth is possibly to designed to describe a celestial alignment (or tying) of three stars or planets which signalled the start of the present era in 3114BC. 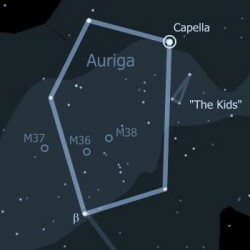 Five-Sky House, for example, could be the constellation that we know as Auriga, which has five stars in a pentagonal shape and looks like a little house (see fig. AUR1). We know from Monte Alban that this constellation was of great importance (click here to read more). Capella was the brightest star in the night-sky for a very long time, and so the Jaguar Stone may be symbolic of Capella. Alternatively, the lower half of the constellation of Orion also hosts an arrangement of five stars, which can be construed as a house, with Orion’s belt being the roof (see fig OR10). The last place mentioned, where Itzamna “tied” the stones together, is called the Lying-Down Sky1, or the Edge of the Sky2. In an earthly context, this is thought to describe the point where sky is pressed against the earth – the horizon. In a celestial context, the Milky Way seems the obvious analogy, with the stars being pressed together. In Egypt, the Milky Way was likened to the river Nile because of the way it meanders across the sky. 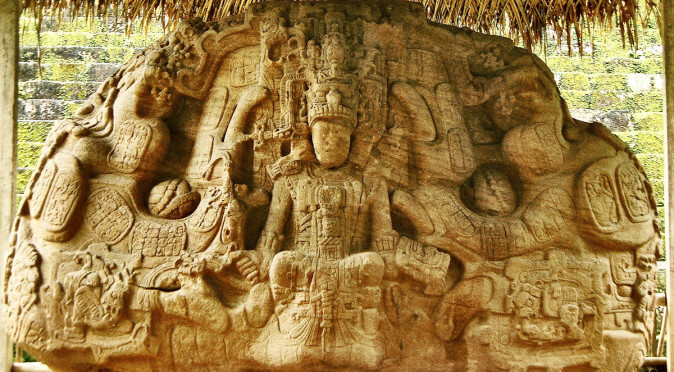 The last stone is related to water, which could indicate that the Maya also believed the Milky Way was a celestial river flowing across the heavens. This would also tie in the custodians of the first stone, the brothers who paddle the dead across the river of the underworld – a river which might also be represented by the Milky Way. 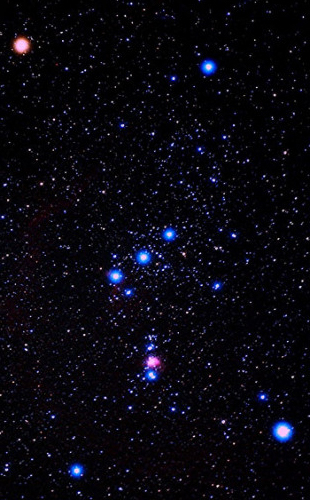 Orion also fills the description of three stones tied together and modern Maya do believe that the triangle of stars at the bottom of Orion, which are arranged like hearthstones, are indeed the three stones of creation and Orion’s belt symbolises the smoke rising from the hearth. This leaves the mysterious second stone, which was left in an as yet unknown place by an unknown God. The name of the God is known to start Black House Great…? – the last word is unknown. The glyph for Great and Red are the same, so without knowing the last word, it is not possible to tell whether the third word is “Red” or “Great”. The location is thought to translate to “Earth Place1“, so it would seem we are looking at a celestial event that we are part of – but this is perhaps too obvious, for the only way we can see something is aligned is because we are at the start of the line. However, there is one other celestial body that could be described as the “Earth Place” – the moon. This could mean the person, Black House Red…?, is actually the red sun moving into the black house of the moon (i.e. an eclipse), where it left the stone. However, the glyph that was translated to “Earth Place” features images of flags or banners2, and could be translated more simply to the “Place of Flags”. The Maya used flags, banners (and fires) to lead people ashore and put that together with the river of the Milky Way and the paddling brothers, and we may have an allegorical account of Itzamna travelling across the celestial waters collecting the stones, aided by the “Paddlers”, then welcomed to Earth by the Sun, where he tied the three stones to start humanity and create the Throne for the First Father. 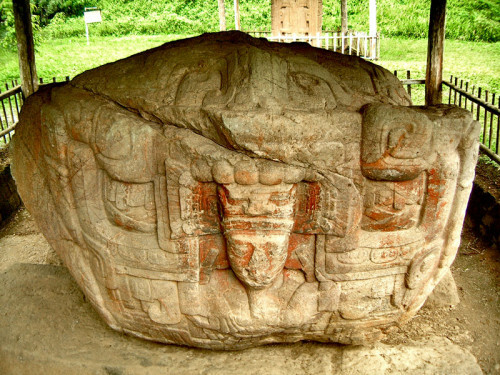 Whilst the Milky Way and Orion are permanent celestial monuments to this event, it seems Cauac Sky wanted to leave a memorial on Earth too, and so the saga was replayed with the stones being brought down river and “tied” on the banks of the Motagua River at Quiriguá to produce a throne for the new First Father, Cauac Sky. Lastly, as a footnote, it would be wrong not to mention that the date of 3114BC as the beginning of a new age recurs around the world. In Egypt the first Pharaoh, Meni, was crowned in approximately 3100BC having unified northern and southern Egypt. 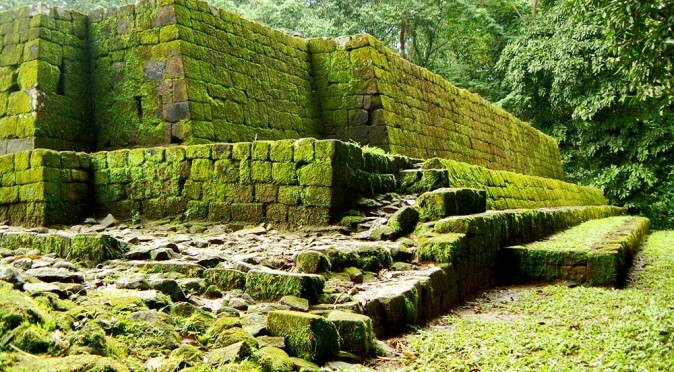 This began the Dynastic Period that flourished for so song and left so many enduring monuments to mankind’s ancient ability – many of which are still so complex we have no idea how the achieved them. There are several similarities between the Monuments of Quirigua and those of Egypt that are covered in a separate article. In India, 3100BC was also the beginning of a new age, the Kali Yaga, and there is a lot of similarity between the artwork and religion of the Hindu’s and that found in Mesoamerica, with violent and grotesque God’s inflicting misery on people – these Gods are also frequently zoomorphic, too. Finally, the previous Mayan age which ended when the present began, in 3114BC, was inhabited by the Wooden People. It is worth noting that the Bronze Age officially began in around 3300BC in Mesopotamia and spread to Egypt by around 3200BC, and event which clearly signals the beginning of man’s industrious age of working with metal rather than wood and stones. Is it all just coincidence? Nice work. I photographed there in 1978, heard about a massacre of the peasants there, so great the locals renamed their river “The River of Blood”–it turned red for weeks after the killings…so sad.